Megapixel suitability is based on analysis of Modulation Transfer Function (MTF) obtained from slanted-edge chart images captured at magnifications of around 0.5× (for inkjet charts) or 1× (for photographic charts) using a high quality DSLR or mirrorless camera and macro lens. The calculations are described in the following links. Test chart suitability for MTF measurements – charts for determining the MTF measurement suitability of several media types (inkjet and photographic; reflective and transmissive). Based on Chart Quality Calculator results. Note that the old Chart Quality Index (CQI) calculation has been deprecated. Megapixel suitability is based on the spatial frequencies where the projected chart MTF on sensor is 0.9 at the Nyquist frequency (0.5 cycles/pixels). We’ll omit the details of the calculations here. The beauty of the new approach is that megapixel suitability can be determined from just three items. a file (the chart MTF compensation file) that has a model of the chart MTF (measured in cycles per object mm). We use the Chart suitability display for Black and White LVT film (which is very much sharper than inkjet prints) as an example. The standard Black & White LVT chart, printed on 12×20 inch film, is designed to have a 27 cm vertical Field of View. 27 cm (on the x-axis) corresponds to MTF@Nyquist = 0.9 (the green diagonal line, below) for sensor height = 5500 pixels (left y-axis) or 45 megapixels at 3:2 aspect ratio (right y-axis). At this high quality level, MTF compensation is not required. If we push the chart to MTF@Nyquist = 0.7 (the olive diagonal line), which is still reasonably good, but requires MTF compensation, we reach sensor height = 8500 pixels (about 100 Megapixels at 3:2 aspect ratio). 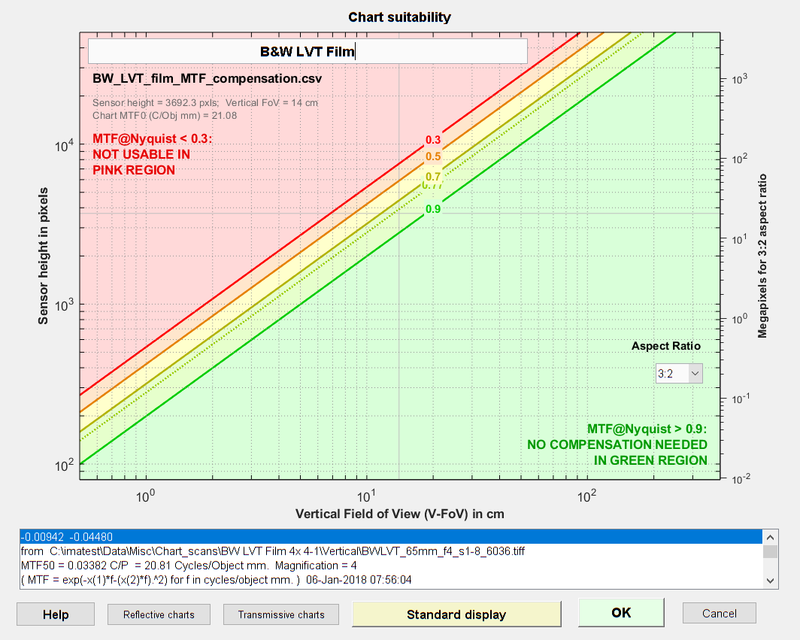 Chart suitability display for B&W LVT film. Click on image for full-size view. that the sensor aspect ratio is 3:2. (it can be changed in the box on the right. 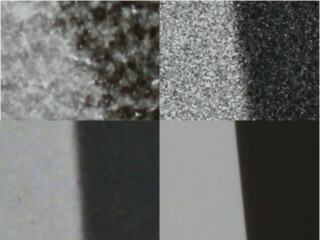 The change only affects the Megapixel numbers, i.e., Megapixel suitibility, on the right y-axis. For 16:9 aspect ratio sensors, multiply the megapixel suitability by 1.185. For 4:3 aspect ratio sensors (with left/right sides of chart cropped), multiply megapixel suitability by 0.889. Imatest 5.1, released in April 2018, has an important enhancement that increases the megapixel suitability of most Imatest charts by up to a factor of 2. The MTF for most charts, which is a function of the chart media and printing technique, has been measured and fit to a simple two-parameter function which can be used to correct MTF measurements by deconvolution (by dividing the measured camera+chart MTF by the chart MTF function projected on the image sensor). The correction can be applied by entering an MTF correction file into the settings windows for any MTF calculations. For more details, see Compensating camera MTF measurements for chart and sensor MTF. A Chart Quality Calculator that uses the new MTF functions is also available. It provides a clearer and more accurate estimate of MTF suitability (including the expected MTF loss from the media without and with the correction) than the older Chart Quality Index. Chart suitability displays for several media types are found in Test chart suitability for MTF measurements. This entry was posted in Test Setup.